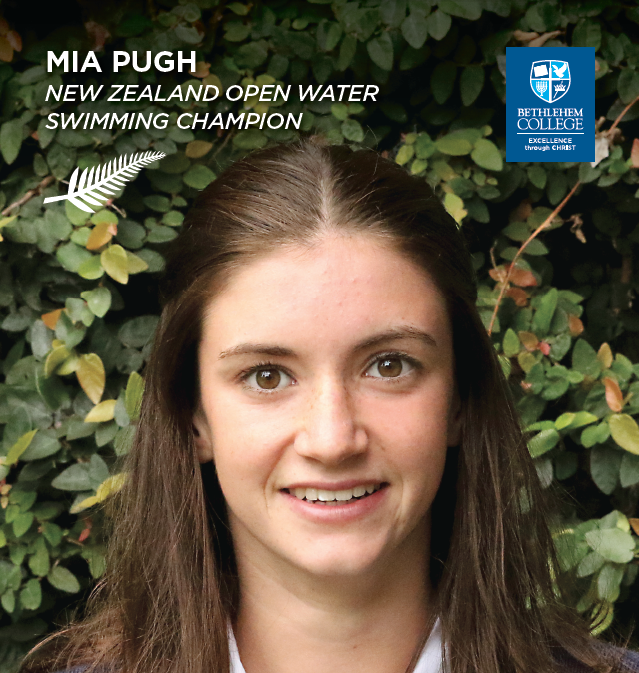 Mia is the Bethlehem College Head Girl for 2018 and is an accomplished athlete and swimmer. She specialises in the gruelling sport of Open Water Swimming and already has some impressive titles and placings to her name. She has recently been selected in the New Zealand team to compete in the Oceania Championships in Papa New Guinea. Her favourite sporting experience was competing in the New Zealand Open Water Championships this year because it was her first attempt at swimming in an open field and she learnt a lot form it. She loved meeting some really inspiring people and enjoyed racing. The perfect conditions also added significantly to her enjoyment of the race. Mia’s 2018 goal is to be competitive at the Oceania champs in both the 5km and 10km and hopefully place in the top 10. Her impressive list of achievements include being named NZ Open Water 5km Champion in her age group for both 2017 + 2018. She also got 2nd in the 10km category open women’s race this year and was overall champion for the 5km race in the Open Women category!